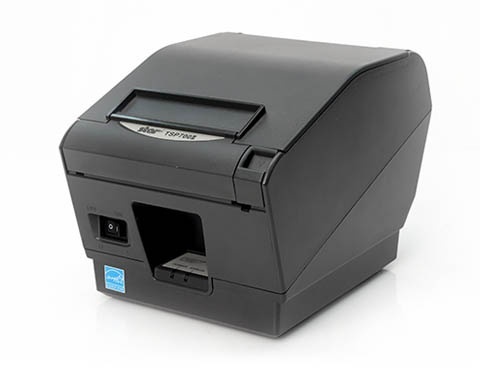 The Star TSP700II is one of the fastest receipt printers in its class for bar codes, receipts, labels and tickets. At a printing speed of up to 250 mm per second, and a double print density with a resolution of 16x8 dots/mm 406x203 dpi, you are guaranteed high-quality printed bar codes and graphics. Via its optional two-colour print, you can bring logos, special offers or promotions to the foreground, giving the receipts a higher value. The TSP700 II accommodates receipt rolls of 82.5, 80 and 58 mm widths and up to 100 mm diameter. Therefore, it can be loaded with a higher paper capacity, making down time for paper roll changes nearly half that of its competition. Its Drop-In--Print system allows the user to simply drop the new paper roll into the printer. External paper feed and paper grades up to 0.15 mm are no problem. Its integrated auto-cutter completes the printing function, even separating the receipts with higher gram weight effortlessly and cleanly, in partial or complete cuts. In addition to a serial, parallel or USB interface, there are also options available with Ethernet and Wi-Fi.